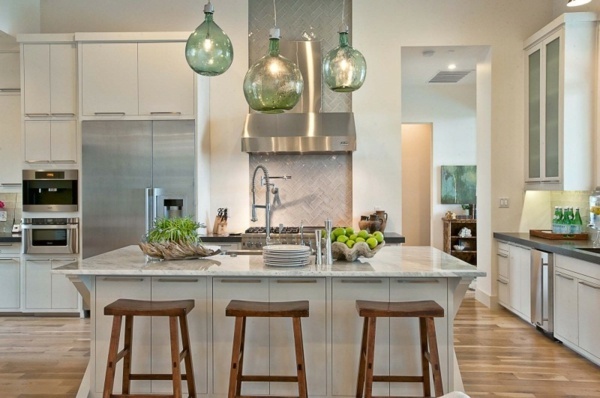 Whether you are getting your house ready to sell, moving into a new home, or just looking for a way to spruce up your kitchen, don't underestimate the power these design elements from Houzz.com. 1. Add a range backsplash. The space between the stovetop and the vent hood presents a design opportunity — a chance to incorporate a ceramic work of art or a mosaic that stands out from the rest of the backsplash. 2. Don’t get stuck in the expected kitchen furniture rut. Opt for something that you wouldn't normally see in a kitchen. 3. Create an accent wall. Mosaic tiles, wallpaper, and paint can be great ways to achieve this. 4. Take chances with large-scale elements. Large vintage letters or a light fixture can work very well. You might think a smaller kitchen needs the cohesiveness of one color on the cabinetry, but a different color on the lower cabinets can add interest and some much-needed color to a room. 6. Grow some fresh ingredients indoors. The shelves across a window provide plenty of sunlight for herbs. It’s a design moment that allows for fresh snippings for cooking within a few feet of the range. 7. Re-purpose something unique into a kitchen island. 8. Consider color for your appliances. Colorful ranges were once something that could run you more than a luxury car, but thanks to their rising popularity, many more reasonable options are available these days. 9. Find a good way to display your collections. A recessed cabinet with glass doors is an update on a classic china cabinet, and can display a collection of traditional objects beautifully. 10. Think beyond typical kitchen light fixtures. Recessed lights and pendants are great, but an ornate brass chandelier can really make a kitchen. Are you thinking about selling your home? Email us at concierge@lizmoore.com, or click below, and we can prepare a complimentary analysis of market value for you – you just may be pleasantly surprised.